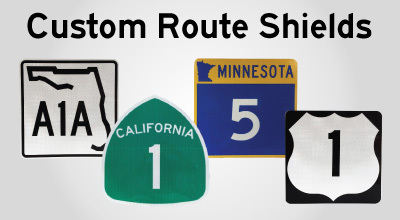 Use our custom street name sign generator to buy reflective street name signs. The letters are on both sides of the sign. The basic reflective version is made using engineer grade sheeting. The highly reflective version is made with high intensity prismatic sheeting. 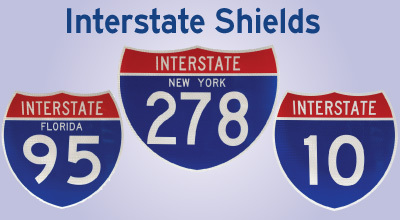 Signs will be manufactured as shown in simulator and usually ship within 1 to 2 business days. Choose size, style, and color. 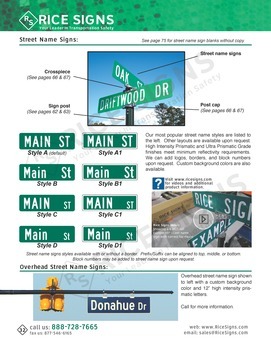 The length of street name signs varies from 18" to 48" wide. Street Name Signs are double sided. Federal M.U.T.C.D. SKU # D3-1. Signs are on .080" aluminum with radius corners. High Intensity Prismatic street same signs meet Minimum Retroreflectivity Requirement as required by the FHWA. 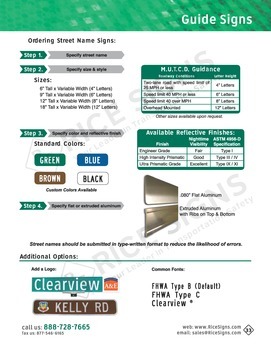 Please note that posts and street name sign brackets are sold separately. Custom Street Name Signs are used to indicate the name of a road. Street name signs most commonly have a green background with white lettering, but they can also have a blue, brown, yellow, white, or red background. Our street name signs conform to Federal M.U.T.C.D. 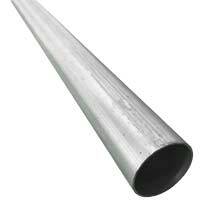 standards, and they are made from high quality retro-reflective films on rust-proof .080" aluminum. 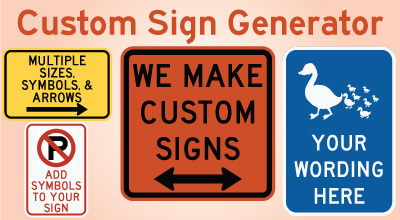 Custom street signs are either 6 inches tall (with 4 inch tall lettering), or 9 inches tall (with 6 inch lettering). The 6 inch tall street name signs are for use when the speed limit is 25 mph or less. The 9 inch tall street name blades should be used when the street's speed limit is greater than 25 mph. Larger street name sign sizes can be custom made upon request. 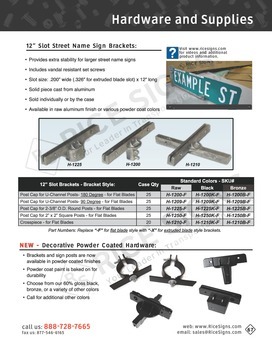 We have a variety of street name sign installation brackets that are used to mount street name signs to the top of posts, and to mount one street sign to the top of another sign. 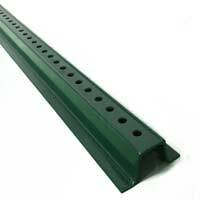 Our street name sign brackets include set screws that hold the sign into the blade slot. A standard allen wrench can be used to tighten the set screws onto the street name sign. Our round post street sign mount (SKU# H-525-F) is used to mount the first street name sign to the top of a 2-3/8" round sign post. The bracket includes 6 set screws that attach the sign into the slot, and the bracket onto the post. Our u-channel post street sign mounts (SKU# H-500-F or H-509-F) are used to mount the first street name sign to the top of a steel u-channel sign post. This bracket is available in the 180 degree version, with the sign running perpendicular to the direction of travel, and as a 90 degree bracket, with the sign running parallel to the direction of travel. The front of the 180 degree street name sign bracket (H-500-F) is pictured below on the left, and the front of the 90 degree street sign bracket (H-509-F) is pictured below on the right. 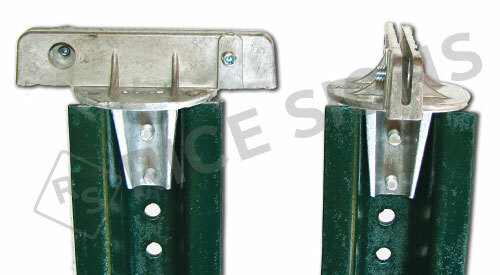 The u-channel brackets include hardware to mount the street sign in the slot, and to bolt the bracket to the post. 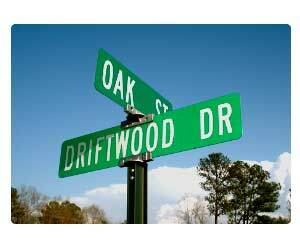 Our street name sign crosspiece (SKU# H-510-F) is used to mount two street name signs perpendicular to one another. 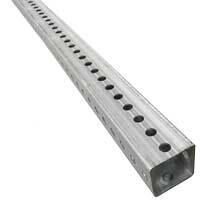 The crosspiece bracket includes four set screws to hold the signs into the blade slots. The set screws can be tightened with a standard allen wrench. 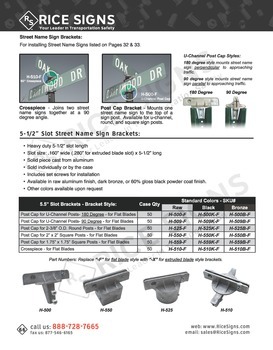 The street name sign mount for square posts (SKU# H-550-F) is used to mount the first street name sign to the top of 2 inch x 2 inch square sign post. The square post street name bracket includes 6 set screws that hold the sign in the slot, and attach the bracket to the top of the square post.